Typography is the main pillar of the print and web design. We know finding the perfect font for your web project can be difficult. This is why we personally handpicked a collection of 50 gorgeous fonts that you can use for free. This gorgeous font is created by Carlos Zurbia from Chihuahua, Mexico. It is inspired by graffiti and has a sleek, brushed look. Milano is one of Marco Oggian’s many amazing design projects. It has been designed on behalf of Citype and resembles the Navigli, a glorious set of rivers, located in the heart of Milano and is inspired the beauty of the city itself. Created by the Stockholm-based designer Marcelo Reis Melo, Skinny Bastards is a raw, hand drawn font with a skinny structure which is filled with energy and personality. Download at Free Goodies For Designers. The Finnish typography designer Mikko Nuuttila is the one responsible for the creation of Jaapokki. The font itself features a bold, blocky type structure with runic looks which goes great with nature-themed imagery. The uneven width of this typeface and the ornamented caps make it an exquisite font with a vintage character and imposing appearance. Agustina Mingote has designed a clean and functional font with a condensed structure. Gudea is great for minimalist designs and goes well when applied on text paragraphs as well as bold headlines. Cabin is a bit thinner than the previous type and although both may seem slightly similar, this one has an elegant finish that makes a wonderful pair for calligraphy headline. We can thank Impallari Type for the creation of this beautiful type. A cheecy, minimalist font designed by Gesine Todt. It’s bold italic version has a playful look and can be used in catchy headlines. Open Sans is one of the most beautiful free fonts that can be found on the Web. It has a universal look, clean symmetrical shape, and elegant finish. It gives off a delicate feel to any minimalist design, it’s readable and balanced, and goes well in any text formatting. One of Font Fabric’s many striking typeface designs, Rex will surprise you with its raw geometric shape and clean look. It comes in three weights, light, bold and inline. The capital letters have a unique finish that gives the typeface an imposing industrial look. Created by Santiago Orozco, Josefin Sans is beautiful sans serif font with curvy arc and terminal shape and a slightly condensed appearance. 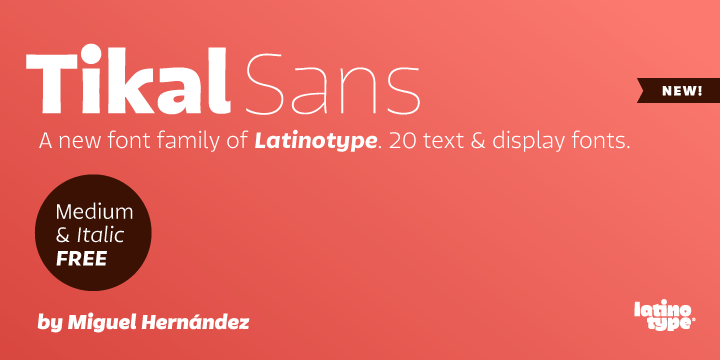 This sans serif font designed by Miguel Hernandez from Latinotype has shrunken ascender and descender which gives it a gorgeous retro look. Arvo is designed by Anton Koovit and can be described as a geometric slab-serif which a minimalist, balanced look. The font comes in 4 cuts and is great for creating sharp headlines. This elegant chuncy font by José Miguel Solé B is a wonderful choice for any design. As seen on one of Canva’s whimsical graphics, Alfa Slab One is a great solution for designing short headlines with a bold look. This papercut typeface by Joël Carrouché has an edgy look and blocky all-caps letters. The uneven cut of the font gives it a sloppy, yet imposing appearance. Another gorgeous font that can be found over Font Fabric that will amaze you with its contemporary retro style. Kan Kin is a bold sans serif font with elegant arc and terminal elements that make it a unique typeface, perfectly suitable for headlines. When he designed Lato, Łukasz Dziedzic probably didn’t expect his font to become such a success. Six years after its creation, the typeface, which name means Summer in Polish, has become one of the most popular web fonts that can be found free online. Designed to provide a unique touch to the appearance of the Linux operating system, Ubuntu provides readability and has a clean, contemporary look. Null beautifully combines the use of shrunken counters and enlarged stems and strokes. This chunky headline typeface, created by one of the undeniable leaders in the free web font industry sector, makes a great pair with sans serif fonts with regular and light weight. At the price of a fair attribution, this great font by Tony Thomas can be your best friend in designing striking headlines for print as well as web projects. It has an edgy, condensed structure and unevenly set arms and shoulders which give it a unique look. If you’re fond of brushed typography with an enchanting appearance, go ahead and play around with this gorgeous font in Canva. Waterly is a watercolor-inspired font created by TheHungryJPEG. El Capitan is a hand-drawn, ornamented typeface created by the Czech designer Petr Knoll. This font will give your designs a rebellious look with a touch of artisan beauty. Etna is a sans serif font created by Krisjanis Mezulis that has the boldness, beauty of a volcano. The English letters closely resemble another free font by Font Fabric called Intro, yet, the Cyrillic version has a rather tribal style that makes it a great alternative to other sans serif fonts. Duwhoers is a hand-drawn, brushed font by Agga Swist’blnk which gives of designs a feeling of freedom and aims at delivering a vintage, homemade appearance. Butles is designed by Fabian De Smet and is a free serif font inspired by Bodoni and Dala Florida. It has 14 weights and is great for text in any size and formatting. Download at Fabian De Smet. Nazaré is a free uppercase typeface designed by David Szebenyi. It has a unique tribal touch inspired by the Portugalian culture and style. Ruffle Beauty is a free hand-drawn font by Anis Iday which has a thin structure that’s ideal for headlines and graphics withs lots of white space that allows the font to “breathe” and provides clear readability. Butch is a free handmade font by Pere Esquerrà with a scribbled look that gives off designs a worn off appearance while maintaining a contemporary look with its sans serif structure and clear lines. File mixes curved and edgy elements. It has a blocky structure with a slight Sci-Fi feel and can be a great choice for bold titles. NOVU — M is a free sans-serif font with a geometrical appearance. It’s designed by Laura Pol and has a balanced structure and condensed tracking. It works well for headlines and gives off an industrial look. Anivers is a sans serif font designed by Exljbris. The font has an edgy appearance which distinguishes its design from other minimalist fonts. Stoked is a unique minimalist font with a touch of vintage elegance. This typeface is designed and released by Marie-Michelle Dupuis and is free for your personal and commercial projects. Break is a modern free font ,designed and released by Rajesh Rajput. The font pack includes five weights and deliver a minimalist look to every project it’s used in. Looking for a bold and beautiful hand drawn typeface? Rissa is a free font which is ideal for headlines. It’s absolutely free and is created by Maulana Creative. Oswald is a popular Google Font and is widely applied to magazine web designs which aim at creating a retro feel while maintaining an elegant, minimalist appearance. If you’re wondering which font will best suit your vintage-styled design, you better check out Bernier. This font, designed by Ryan Pyae, has a textured appearance and comes in three styles: Regular, Distressed, and Shade. Another web font designed by Exljbris that has won a place in our collection. Fertigo is a sans serif font with elegant, brushed look that provides high readability. Aquatico is one of the many amazing projects of the talented designer Andrew Herndon. It’s a free font that you can use in your personal web design projects. Aquatico is inspired by various sea creatures and has a clean, rounded look. Chunkfive is created by The League of Movable Type. As it’s clear from the name, this font presents a chunky, stylish look that’s great for grabbing visitor’s attention. Another Font Fabric typeface that has made it to our list. Intro is among the many amazing fonts created by this company. It has a blocky look and symmetrical letters that make it a great choice for web headings with minimalist design. Aller is a sans serif font that’s widely used in various web design and print projects. It is created by Dalton Maag Ltd and comes in three weights that provide beautiful web copy formatting. This bubbly font is great for slider headings and short titles. It is a bit difficult to read if it’s not the right size, yet, it’s a great solution for web projects which aim at uniqueness. This minimalist sans serif typeface comes in five weights and has an overall thin and condensed structure. It has two additional decorative versions which can add diversity and uniqueness to every design. Roboto Slab is popular choice for the web. It’s a condensed sans serif with a minimalist appearance that gives off an industrial feel when combined with the right elements and color palettes. Delicious is yet another popular web font that creates just the right balance between elegance and minimalism to become one of the top fonts used on the Web. Bellaboo is a sans serif typeface which has a clean, brushed look. It is designed by Marcelo Melo and is specially optimized for the Web. Order is a geometric, sans serif font which comes in three weights: rounded, light and outline. It’s created by Mike Hill and has a unique characters design that’s great for short CTA headlines on sliders and web headers. Download at The Freebies Bay. This handwritten typeface is created by flou and cute punk. It has a thin structure and a textured style that makes it great for websites which target a younger audience. Balanced, clean and symmetrical, Glacial Indifferencec is a great choice for every element of your web design. You can thank Alfredo Marco Pradil for creating this excellent typeface. Frinco is a thin sans serif font with nautical look designed by Ryan Pyae. It’s absolutely free for personal and commercial projects. Did You Like This Free Web Font Collection? We did our best to find and share with you some of the most unique and eye-catching fonts that can be used for free. We’re excited to see what amazing designs you’ll come up with so don’t hesitate to share your Canva projects in the comments below.